These boxes are shaped as miniature urns. There is a unifying theme of wave patterns rendered as decoration on the body of each piece. 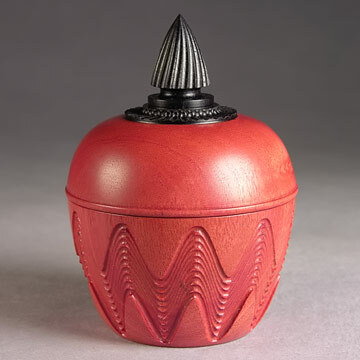 All have finial handles on the lid and are decorated inside with rosettes, mostly cut in rose patterns through inlaid layers of contrasting materials. The thumbnail index is arranged in succession from right to left, beginning at top right, and the captions are uniquely numbered for each piece. Click a thumbnail image below to view a larger image. There is a contact form to follow up on price and availability of any pieces of interest.